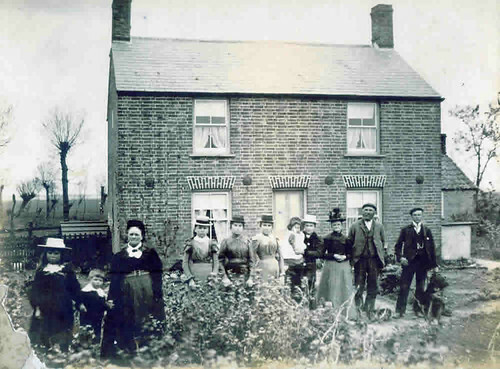 The Gilbert Family at Littleport, originally uploaded by familytreeuk. Earlier this year I was given this incredible photograph showing three generations of my Gilbert family outside their house at Burnt Chimney Drove, Littleport, Cambridgeshire. Second from the right (not counting the dog!) is my Gt Gt Grandfather, James Gilbert – farmer of Littleport. His wife, Elizabeth (née Howlett) stands proudly next to him. My Great Grandmother, Clara Gilbert is 6th from the right, with at least two of her sisters next to her. Third from the left, is Caroline Coe – my Gt Gt Gt Grandmother – Elizabeth Gilbert (Howlett)’s mother. She married Thomas Howlett in nearby Mildenhall, Suffolk but when Elizabeth was at most, 2yrs old, he died in his mid 20s. 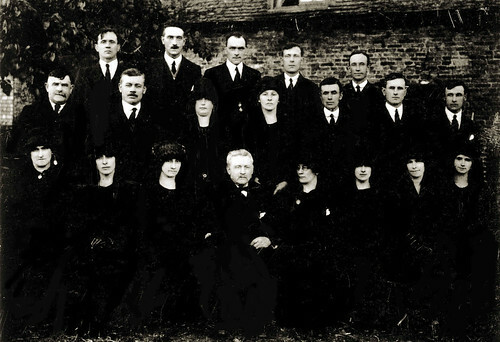 Caroline re-married to a Robert Coe and they lived next door to the Gilbert family in this photo. I’m identifying the photo as being about 1910-1916. It has to be before 1916 as this is when both James Gilbert and his wife Elizabeth died. Caroline Coe died shortly afterwards. It’s impressive to find a photo with so many relatives in it AND outside their house. I previously had no photographs of any of these people with the exception of my own Gt Grandmother.